HONOLULU, Hawaii, April 17, 2012 (ENS) – Without greater protection, 56 coral species in U.S. waters are “likely” or “very likely” to go extinct by the end this century, due to ocean warming, acidification and disease, finds a new federal government assessment now open for public comment. The National Oceanic and Atmospheric Administration, NOAA, says its ongoing assessment to determine whether to list 82 Caribbean and Indo-Pacific coral species under the Endangered Species Act is the most complex listing process the agency has ever undertaken. In Honolulu, NOAA’s Pacific Islands Fisheries Science Center Friday released a status review of 82 corals that are being considered for protection in response to a 2009 petition by the Center for Biological Diversity. The status review concludes that human activities generating the greenhouse gas carbon dioxide, CO2, are responsible for much of the risk to which these corals are subjected. 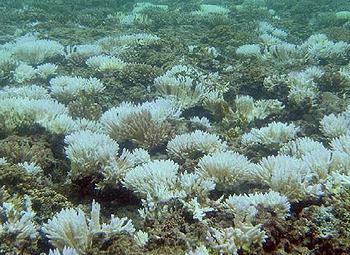 “The combined direct and indirect effects of rising temperature, including increased incidence of disease and ocean acidification, both resulting primarily from anthropogenic increases in atmospheric CO2, are likely to represent the greatest risks of extinction to all or most of the candidate coral species over the next century,” the assessment states. The 82 corals that are candidates for protection under the Act live in U.S. waters from Florida and Hawaii to U.S. territories in the Caribbean Sea and Pacific Ocean. Eight of the petitioned coral species occur in the western Atlantic and Caribbean, and 75 occur in the Pacific. Seven Florida and Caribbean corals are extremely likely to go extinct by 2100, according to the assessment. Those seven species are: Montastraea annularis, Montastraea faveolata, Dendrogyra cylindrus, Montastaea franksi, Mycetophyllia ferox, Agaricia lamarcki, and Dichocoenia stokesi. In its petition, the Center pointed out that the Caribbean region suffered massive losses of corals in response to climate-related bleaching and mortality events of 2005, including a record-breaking series of 26 tropical storms and elevated ocean water temperatures. 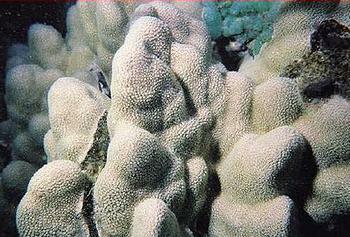 Disease also has taken its toll on the candidate corals. At least two of the 82 candidate species, Dichocoenia stokesi and Montastraea annularis, have experienced “documented dramatic, and likely unrecoverable, declines in local populations (up to 60% in one year) from disease, either alone or in conjunction with major bleaching events,” according to the status report. The Center asserted that the U.S. Virgin Islands lost 51.5 percent of their live coral cover, and citied research showing that Florida, Puerto Rico, the Cayman Islands, St. Maarten, Saba, St. Eustatius, Guadeloupe, Martinique, St. Barthelemy, Barbados, Jamaica, and Cuba suffered bleaching of over 50 percent of their coral colonies. One of the candidate corals, Porites pukoensis, is already classed as Critically Endangered by the International Union for Conservation of Nature. The status report makes no recommendation about whether the corals may warrant protection under the Endangered Species Act; that is a separate evaluation to be conducted by the National Marine Fisheries service. In both documents, NOAA explains that releasing them is not a part of the normal rulemaking process, “it is only an engagement process that allows us to be transparent and open in our decision making,” the agency says. The Fisheries Service is accepting comments on the coral status review and management reports until July 31, 2012. Under a settlement agreement with the Center, the Fisheries Service will make a determination on whether listing is warranted for the corals by December 1, 2012. Should the agency determine that a listing is warranted, it will publish a proposed rule in December 2012 for additional public comment. Click here to find out how to submit comments. In 2006, the Center secured protection for staghorn and elkhorn corals, making them the first, and so far, the only corals listed under the Endangered Species Act. “I’m eager to show my kids the wonder of a coral reef. I worry that if we wait too long, they’ll never get to experience a healthy reef teeming with colorful life,” said Sakashita. Coral reefs are inhabited by 25 percent of all marine life and play a vital function in ocean ecosystems, Sakashita explains.